Resources – Communicate 2 Connect Inc.
Julie Lawrence’s printable PDF of the NVC process, plus feelings and needs, which you can fold up and put in your wallet. (Instructions for folding into a booklet may be found there). There are many amazing NVC newsletters and weekly tips series available, which will enhance your ongoing practice and learning with NVC. Here are just a few. Subscribe to free weekly Connection Gems from LaShelle Lowe-Charde at Wise Heart, and check out her other free resources to download. Especially recommended is her self-empathy worksheet. Cate Crombie was one of the first NVC trainers in Australia, and is also the CNVC Assessor for Certification Candidates for the entire southern hemisphere. She runs regular 2 day “Foundation Training” workshops at the Relaxation Centre, which are highly recommended, as well as intermediate and advanced level trainings. You can find a calendar of Cate’s trainings here. The NVC Australia website lists NVC trainings available all around Australia, and lists our Australian-based NVC trainers, as well as trainers visiting from overseas. NVC Academy offers a wide variety of online and teleclass courses in NVC, as well as offering a very large online multi-media library of NVC resources. 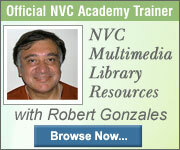 Want to go Deeper with your NVC Learning and Practice?